Tell the truth, have you ever given a tie as a gift for Father’s Day? Yes, I know, dads can be difficult to buy for. But a tie? Really? Here’s something to consider: Check out this collection of poems and stories celebrating dads. Good news, you could win these books! To enter our random drawing, post a comment to this blog and let us know if you’ve ever given a tie as a gift. Submit your comment no later than 11:59 pm EDT on June 27, 2017. One lucky teacher will win. Watch out, we might even throw in an ugly tie to round out the prize! And speaking of winning, here are some other exciting contests and sweepstakes that you could win. 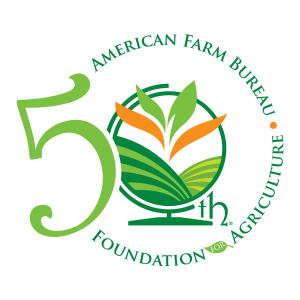 The American Farm Bureau Foundation is celebrating its 50th anniversary by giving away 50 grants valued at $50 for the Foundation’s store. Click here to apply. 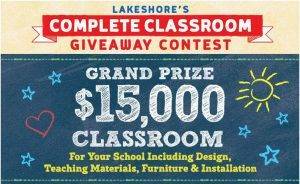 Attention PreK through grade 2 teachers: Lakeshore Learning has a sweepstakes for you. 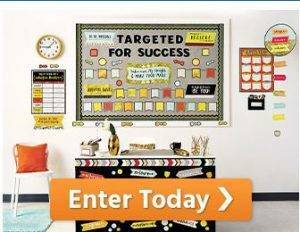 Enter for a chance to win a fully furnished classroom worth $15,000 in the Complete Classroom Giveaway contest. Get the details on how to enter at LakeshoreLearning.com/contest. Hope those contests will “tie-d” you over until next week! Yes, I gave ties to my Daddy for Father’s Day … many times. He loved every one! As we are going through some of his things, we’re finding he actually kept many and wore them when we came to visit as adults! Yes, I have definitely given a tie before. He liked them when he was working and had to dress up everyday. Yes I’ve ties as gifts many times. I’ve given ties as gifts, but not to my father. He prefers Old Spice 🙂 Just yesterday I made a cake with a tie as a decoration. Does that count? My dad is a classy person and likes to dress nice. So, again this year I’m getting him a three piece suit with accessories and take him out to his favorite seafood restaurant. No, I have never given a tie on Father’s Day. Yes…ties have been given when nothing else better is found. I have given ties as gifts but not for Father’s Day. Yes I’ve given a tie as a Father’s Day gift when I was a kid. Yes when i was a child. I’d love to win the Carson Dellosa and Visa gift cards. I would use them as a head start on setting up my classroom for the Fall. It is so much fun to get new things for the beginning of school Thanks for offering such nice gifts and surprises. I have actually given ties as gifts to my brother – at his request – but never for Father’s Day! My dad never wore a tie so no ties, but tshirts, underwear and now I make him baked beans nad brown bread for Father’s DAy. No, I have not ever given a tie as a gift. Yes, in the past I gave my father ties, especially when I was younger and my mother allowed me to pick out his gift myself. My father-in-law likes to eat, however, so now I give lots of gift cards to restaurants instead. 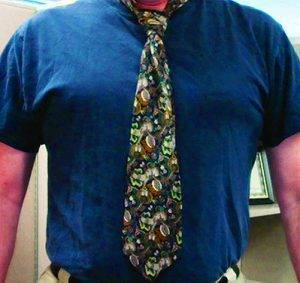 My dad works in the business field, therefore, ties are part of his everyday attire. I always try to find/give father’s day gifts associated with his favorite hobbies and/or sports teams. Only gag ties for holidays for the laugh factor!